Essential components of the skin’s hydrolipidic barrier. Plays a key role in hydrating the skin. Used for preventing the skin from drying out. The structure of the outermost layer of skin protection, the Stratum corneum, varies according to our age and the season, a fact related to the skin’s concentration in lipids. During cold winters and hot summers, lipid secretion decreases and the skin becomes dry, and sometimes shows other signs of accelerated aging: rough patches, redness, flakiness, tightness, itching and inflammation. Ceramides are essential components of the skin’s hydrolipid barrier, representing 35%-40% of its intercellular cement. They play a key role in the function of this barrier, hydrating the skin by literally ‘trapping’ water. Unfortunately, ceramide concentration in the skin declines significantly as we get older. 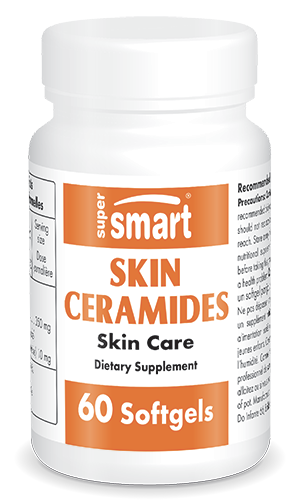 Supplementation with ceramides is therefore essential to provide the skin, from within, with the structural elements it lacks. The ceramides produced naturally by young skin are chemically identical to those present in wheat grains. Lipowheat™ is a unique, proprietary complex of wheat-extracted ceramides and glycosylceramides, which provides powerfully hydrating nutritional support, as has been clearly demonstrated in three clinical studies all of which reached similar conclusions. Following three months’ supplementation with 200mg of Lipowheat™ a day, women with dry, slack skin reported an astonishing improvement, both in their skin’s appearance and in the way it felt. These results were confirmed by electrochemical analysis, with 95% positive results in hydration-associated parameters. Furthermore, symptoms of chronic itching were totally eliminated. Oral supplementation with Lipowheat™ ceramides is thus well-established as an easy and effective way of restoring youthful levels of ceramides to aging skin. This manifests as a significant improvement in hydration, elasticity and health of dry skin. Take for three months in winter to protect skin from the damaging effects of cold weather, or in summer to alleviate skin dryness from exposure to the sun, or as required, or as a complement to topical hydration products. Attention : contains a wheat derivative.